View cart “My Words Shall Not Pass Away” has been added to your cart. “La Forge was a boy soprano. He first studied piano with his older sister, and went to Vienna in 1900 to study with Theodor Leschetizky. He recorded prolifically for the Victor Talking Machine Company, as both a soloist and accompanist starting in 1906. As a soloist, he recorded works by Chopin, Liszt and MacDowell. In performance he usually accompanied entirely from memory, considered an unusual feat for an accompanist. In his biographyPathways of Song, La Forge claimed that he had ‘a repertoire of over five thousand memorized accompaniments embracing all schools’. He toured Europe, Russia, and the United States as an accompanist to Marcella Sembrich. 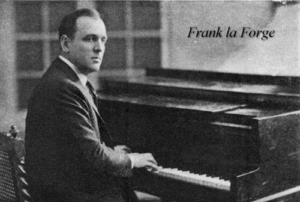 La Forge moved to New York City in 1920, where he became a music teacher, coach, and accompanist. He taught a number of important American singers, including Marian Anderson, Lawrence Tibbett, Marie Powers, Emma Otero and Richard Crooks. He served as accompanist for many vocal stars and instrumentalists of the day including Johanna Gadski, Ernestine Schumann-Heink and Margaret Matzenauer. His longstanding musical relationship with Metropolitan Opera soprano Lily Pons from 1937 until his death, saw the production of recital tours with flutist Frank Versaci, down the eastern seaboard and in British Columbia.